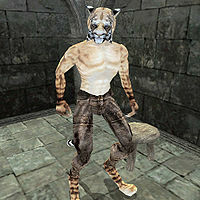 Joshur is a Khajiit bard found in Ebonheart. He wrote an offensive poem that got him into trouble, and now he is serving jail time at the prison of Fort Hawkmoth. If you have the Hawkmoth Prison Cell Key, you can offer to free him, but he will decline rescue, saying he will just get caught again. His only possession is the common pants he is wearing. Like all Khajiit, he can see well in the dark and can demoralize others for short periods; otherwise he knows no spells. "Joshur wrote a stupid poem and now Joshur is in bad trouble." "No, Joshur is Khajiit. Joshur just get caught again." This page was last modified on 31 January 2018, at 21:43.